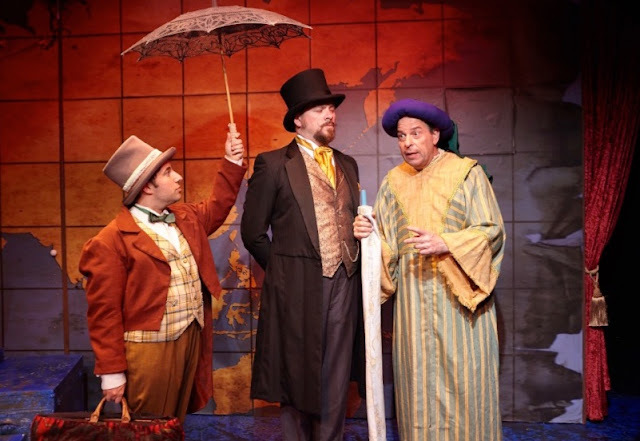 Carol's Theatre Reviews ~ It's Fun To Go Out: “Around The World in 80 Days” Hits Just The Right Stride at North Coast Rep.
“Around The World in 80 Days” Hits Just The Right Stride at North Coast Rep. If your idea of a perfect traveling experience is sitting in you favorite seat at North Coast Repertory Theatre and avoid all the pitfalls traveling affords, join those who on opening night traveled the world in 80 days (on trains, steamers and elephant, and fraught with danger, adventure and outrageous happenings) with Richard Baird, Loren Lester, Omri Schein, Lovlee Carroll and Will Vought, who plays 19 characters, and together with the rest of the cast play 40 characters by shows end. Forget about the balloon and put on your imagination caps for a journey with some folks you will get to know in that time frame, and more importantly, some you will probably want to meet up with on your next trip or not. 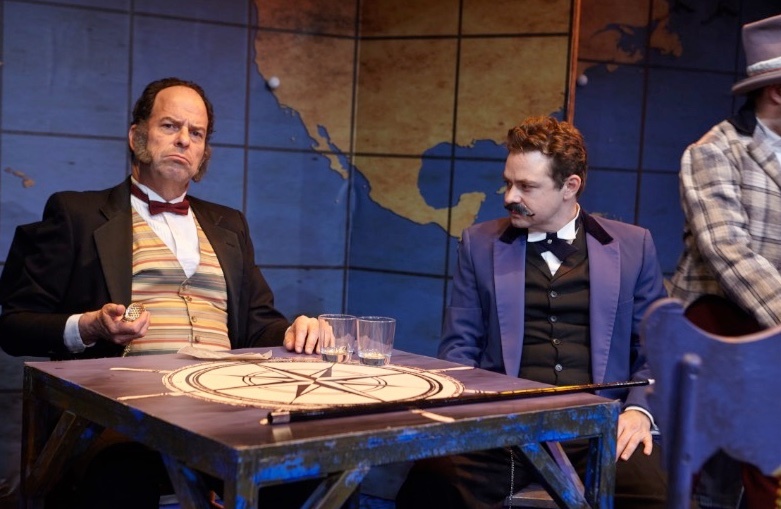 Jules Vern’s 1780 classic adventure “Around The world in 80 Days” has been made into a motion picture and adapted to several play versions most following the speedy journey around the world and stopping off for a quick look- see in different countries, continents and hotel lobbies usually with a cast larger than seen at NCR. 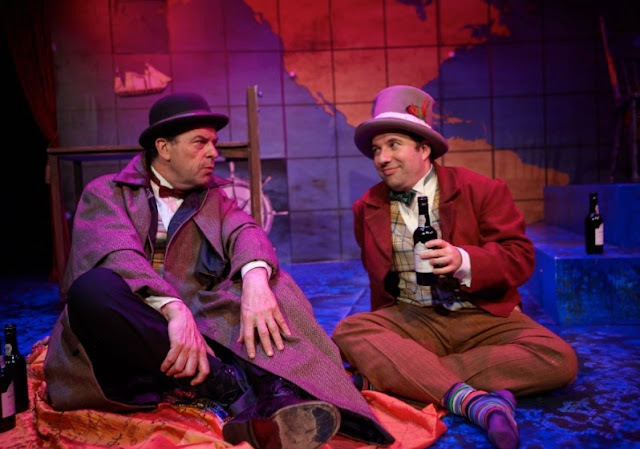 This particular version, somewhat resembling Alfred Hitchcock’s “The 39 Steps”, was adapted by Mark Brown and deftly directed by Allison Bibicoff and is in a San Diego Premiere running through Feb. 4th. It is a hoot and a howl. Briefly, our central character Phileas Fogg (Baird is a perfect fit as the mysterious, meticulous and methodical Fogg) is at his Reform Club where his whist partners are discussing a recent bank robbery. The robber got away scot-free with fifty thousand pounds from the Bank of London. They argue back and forth about how this robber could or not, get away with the crime. It is now 1872 and Fogg pipes in that the world has grown smaller (than it was 100 years ago) because of the completion of the new Great Indian Peninsular Railway, making it much easier to make it around the world in 80 days (a mathematical fact according to Fogg) thereby eluding the law. By making this statement he contradicts some of his friends who insist that it would take three months. At this time, a twenty thousand pound wager is agreed upon that sets this tale into motion. If he’s to win the bet, he must make all the right connections. However even without airline delays that are so much a part of our now daily lives, unexpected trials and tribulations will get in the way of our fellow travelers. Fogg, whose routine is exactly the same everyday, summons his Parisian valet Passepartout (Omri Schein is one hell of an actor doing the almost impossible). He is perfect as the versatile decoy and does yeoman’s work as the over the top clown and do all -be all servant to Baird’s steady as she goes gentlemanly aura. Omri’s Passepartout claims to have been a singer, horse rider, trapeze artist, tight ropewalker and goat herder as he tumbles on to the stage and does a head stand. He is ordered by Fogg to take “two carpet bags with the bare essentials” along with the Bradshaw Guide that contains timetables of every steamer and railway in the world, and be prepared for some travel. And the trek begins on the train with the first stop in Brindisi and from there to Bombay via Suez. It is here we meet up with Inspector Fix (Loren Lester). He follows Fogg throughout the journey, resembling Colombo in a long trench coat, convinced that Fogg is the thief that mastermind the bank robbery. If you combined Colombo, Inspectors Clouseau and Poirot, Fix is the embodiment of the classic bumbling detective. He hides behind newspapers, peeks around corners and is, in general a royal pain in the arse. His goal is to stop Fogg at his own game, slow him down in anticipation of an arrest before he sets foot back on British soil. Unfortunately for him, as ‘twas not the case, he was outwitted by Fogg and company at every turn. 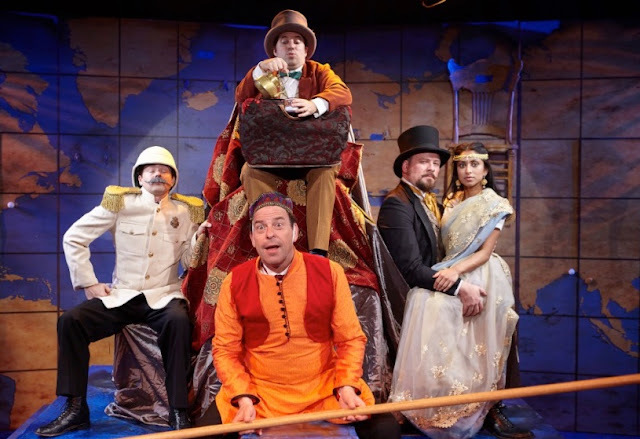 Cast of "Around The World in 80 Days"
One of the most interesting characters we meet up is Kamana Aouda in the person of Lovlee Carroll daughter of a wealthy merchant and recent widow. In India, Fogg rescues her after a near death mishap and the two become traveling companions, which in turn puts a little zip in Foggs step. I’ll let you watch that one play out because Carroll is so convincing, and yes a bit coy as the sought after and beautiful Aouda. 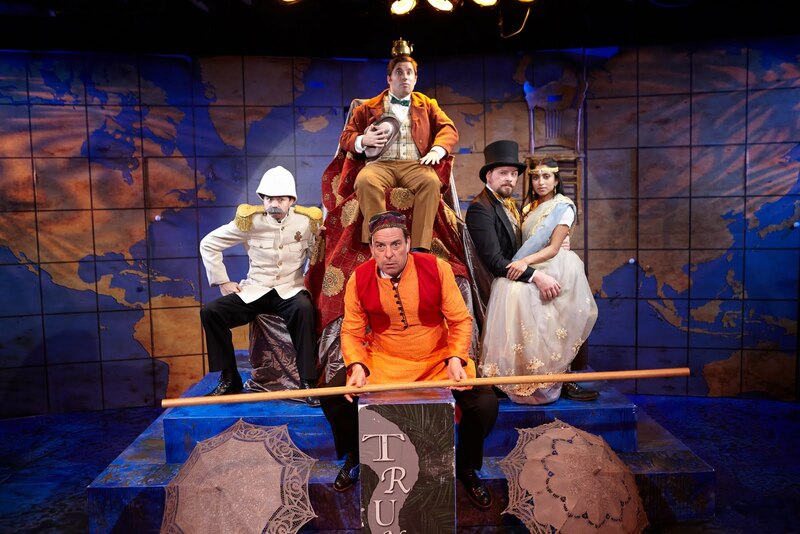 Thanks to set designer Marty Burnett’s clever (a la ‘Laugh In’ type set) with the map of the world as a backdrop, drawers that pull out for various and sundry uses; a step up pyramid for the ship’s deck, 4 chairs for train travel, a chest with again, miscellaneous ‘stuff’ and in what is the most clever, two umbrellas representing elephant ears, doors leading to other doors for the coming and going of the various characters that come and go. Baird, for the most part, stays in character throughout. Holly Gillard’s props are exceptional and Kimberly DeShazo’ costumes are worth noting for their (for lack of a better word) flexibility and originality. Dave Mickey’s sound design gives credence to the type of travel, say fog horn, train whistle, etc., and Matt Novotny’s lighting puts everything into perspective. Allison Bibicoff’s hits all the right strides with enough mystery to have you shaking your collective heads on the way out wondering how they managed to make it all come together and finish their game of whist at the end of 80 days. NCR’s “Around The World in 80 Days” is a whimsical, theatrical, magical, capricious, playful, you name it, romp. It’s well worth the trip to Solana Beach. Enjoy.